Around 1375 the Scots poet John Barbour said that "the round table" was south of Stirling Castle, and in 1478 William of Worcester told how "King Arthur kept the Round Table at Stirling Castle". Sir David Lindsay, the 16th century Scottish writer, added to the legend in 1529 when he said that Stirling Castle was home of the "Chapell-royall, park, and Tabyll Round". The first known record of the site being called the King's Knot is from 1767, by which time it was being leased for pasture. 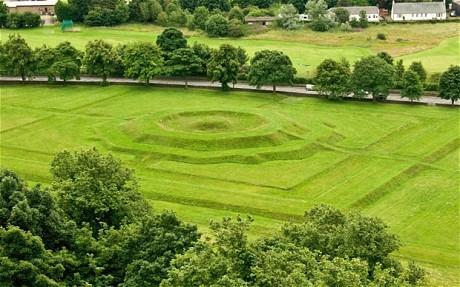 Locals refer to the grassy earthworks as the "cup and saucer", but aerial photographs taken in 1980 showed three concentric ditches beneath and around the King's Knot mound, suggesting an earthwork monument had preceded it. The new survey -- funded by Historic Scotland and Stirling City Heritage Trust -- used the latest scientific techniques to showing lost structures and features up to a metre below the ground. Mr Harrison, who has studied the King's Knot for 20 years, said: "It is a mystery which the documents cannot solve, but geophysics has given us new insights. "Of course, we cannot say that King Arthur was there, but the feature which surrounds the core of the Knot could explain the stories and beliefs that people held." Archaeologist Stephen Digney, who coordinated the project, said: "The area around Stirling Castle holds some of the finest medieval landscapes in Europe. "This investigation is an exciting first step in a serious effort to explore, explain and interpret them. The results so far suggest that Scotland's monarchs integrated an ancient feature into their garden, something we know happened in other countries too. "We are looking forward to the next stage in September when we hope to refine some of the details." Dr. Kirsty Owen, Cultural Heritage Adviser at Historic Scotland, added: "The project has the potential to add to our knowledge of the landscape context of the medieval and early modern occupation of Stirling Castle. "The ditches identified may intriguingly be part of historically documented earlier garden features, or if prehistoric in origin could add to our scant knowledge of prehistoric activity at Stirling Castle. "We look forward to seeing the results of the next phase of investigations. "Futher work including a ground-penetrating radar survey, is now planned to take place next month to find out more.